On July 30th, 2015, Alice celebrated her 103rd birthday! 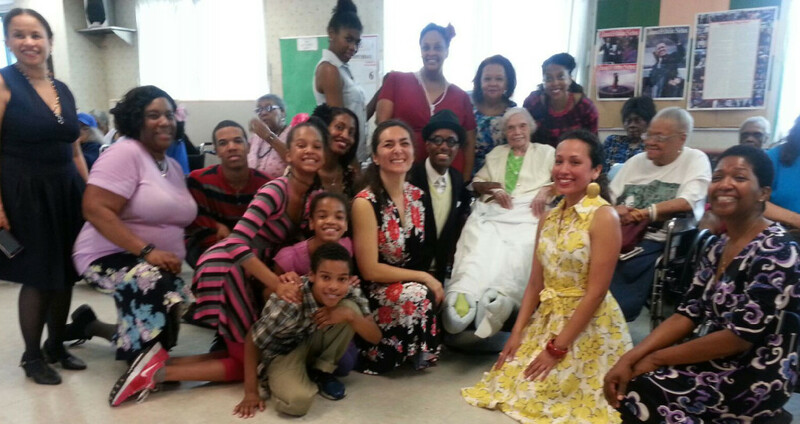 A troupe of dancers from a school in Harlem came to perform for her and all the residents. She was positively glowing! I’m wondering, there must be some extended family members that are still alive. Unless, in those days she rebelled and followed her dream and those family members at that time didn’t talk about it. Alice was in contact with no living relatives for the entire time we’ve known her. Of course she must have some out there somewhere, but she seemed to have completely lost touch. She was from Chicago originally, so likely they’re out there. Next Next post: Alice Gets a Letter from the White House!